BIG SALE!! CRYSTAL & GLASS ROSES BIG SALE!! A winding rose stem with an exquisite faceted rosebud. Handmade crystal from the Kensington Collection. The Rose is a symbol of everlasting love which is captured in this hand made Turkish crystal creation. A winding rose stem with an exquisite ruby rosebud. Handmade crystal from the Kensington Collection. The Rose is a symbol of everlasting love which is captured in this hand made Turkish crystal creation. A winding rose stem with an exquisite sapphire rosebud. Handmade crystal from the Kensington Collection. The Rose is a symbol of everlasting love which is captured in this hand made Turkish crystal creation. A lovely standing rose stem with a ruby red bud. Fashioned in delicate crystal, this rose is the perfect gift of love or appreciation. Handmade crystal from the Kensington Collection. 6" H x 1 1/2" x 1"
A lovely standing rose stem with an Aqua bud. Fashioned in delicate crystal, this rose is the perfect gift for a loved one. Handmade crystal from the Kensington Collection. A lovely standing rose stem with a Cobalt blue bud. Fashioned in delicate crystal, this rose is the perfect gift for a loved one. Handmade crystal from the Kensington Collection. A lovely standing rose stem with a pink peach bud. Fashioned in delicate crystal, this rose is the perfect gift of love or appreciation. Handmade crystal from the Kensington Collection. A lovely standing rose stem with a Sapphire blue bud. Fashioned in delicate crystal, this rose is the perfect gift for a loved one. Handmade crystal from the Kensington Collection. The Large Crystal Ruby Rosebud makes a beautiful edition to any collection and a wonderful gift. This flower is complete with thorns and is in limited supply. Delicate handmade crystal from Turkey. 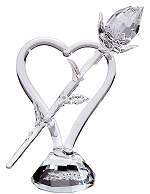 The Crystal Rose Sculpture w/Velour Box makes a lovely Valentine's or Mother's Day gift. The Rose comes with a beautiful Velour Box making this a treasure that will last. This item is in limited supply. Delicate handmade crystal from Turkey. 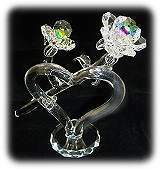 A Heart and clear crystal Rosebud, two eternal symbols of love, brought together in crystalline splendor! High quality Turkish handmade cut crystal from the Sedef Collection. A pair of jeweled flowers are lovingly entwined in this crystal Heart! The blooming flowers are each centered with a large Peacock Crystal that make for a rainbow light bouquet. Delicate handmade crystal from Turkey. 5" H x 5 1/2" W x 1 7/8"
A winding rose stem with an exquisite pink rosebud. Handmade crystal from the Kensington Collection. The Rose is a symbol of everlasting love which is captured in this hand made Turkish crystal creation.